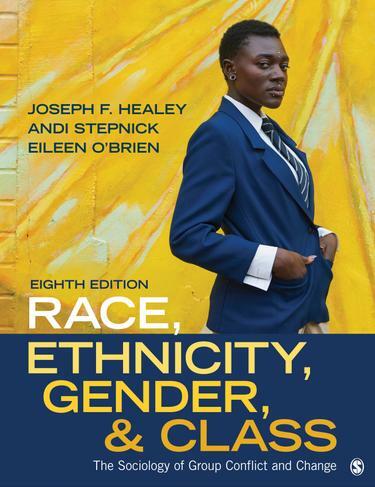 Known for its clear and engaging writing, the bestselling Race, Ethnicity, Gender, and Class by Joseph F. Healey, Andi Stepnick, and Eileen O’Brien has been thoroughly updated to make it fresher, more relevant, and more accessible to undergraduates. The Eighth Edition retains the same use of sociological theory to tell the story of race and other socially constructed inequalities in the U.S. and for examining the variety of experiences within each minority group, particularly differences between those of men and women. This edition also puts greater emphasis on intersectionality, gender, and sexual orientation that will offer students a deeper understanding of diversity. New co-author Andi Stepnick adds fresh perspectives to the book from her teaching and research on race, gender, social movements, and popular culture. New coverage of intersectionality, gender, and sexual orientation offer students a deeper understanding of diversity in the U.S. The text has been thoroughly updated from hundreds of new sources to reflect the latest research, current events, and changes in U.S. society. 80 new and updated graphs, tables, maps, and graphics draw on a wide range of sources, including the U.S. Census, Gallup, and Pew. 35 new internet activities provide opportunities for students to apply concepts by exploring oral history archives, art exhibits, video clips, and other online sites.